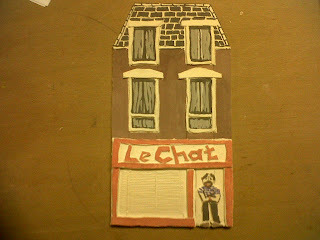 Second ceramics class last night and painted (or under-glazed) the tile I'd made last week. Very efficiently, somebody at the college had in the intervening week both supervised the drying of the clay and its first firing in a kiln. Everyone is so helpful in the class. 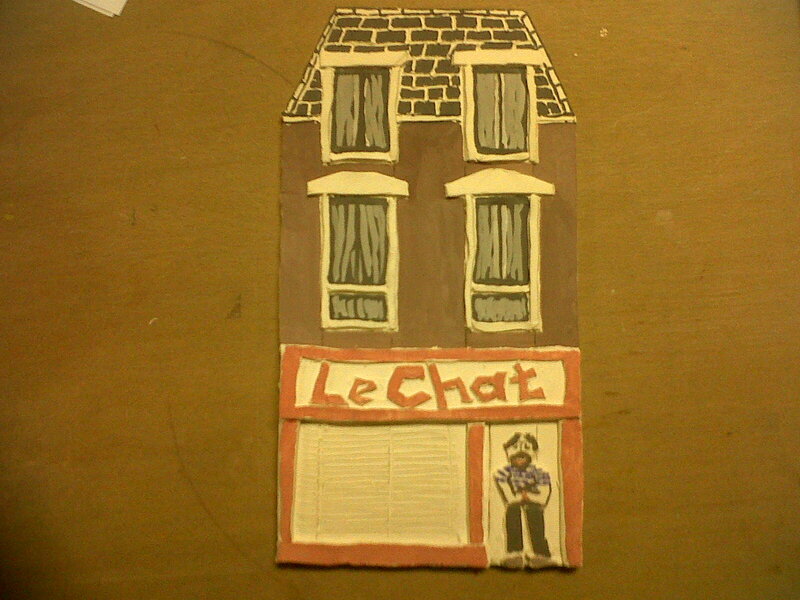 One woman said that she would bring in some small painted cards she had of French houses for me to look at. Apparently, she painted them. Everyone in the class is vastly more artistic than I am. However, I'm confident that I will successfully manufacture items for my model railway. However, I'm not sure that in future I can use the same technique I did for this piece. The problem is that this little building is far too big for HO scale probably by 150%. The features on the tile - window sills etc are made by sticking on small pieces of clay. Obviously, a smaller scale building will require the cutting and shaping of even smaller pieces. I dabbled in this last night with some spare clay and found it a) very fiddly and b) that the clay dried out very quickly. But there are other techniques available. Whatever happened to Soy Bomb? 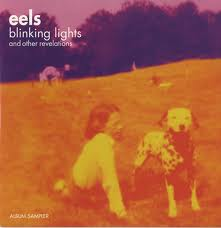 A very melancholic (and, in my opinion, beautiful) song on the Eels album: "Blinking Lights and Other Revelations"
Quite an interesting tale behind the lyrics of the song which can be looked up on the internet. Yes, we're preparing already. There won't be much to see on the layout front: it's very difficult, technically, but there will be the bare bones to show you. Jack has seen some of it, but I swore him to secrecy.